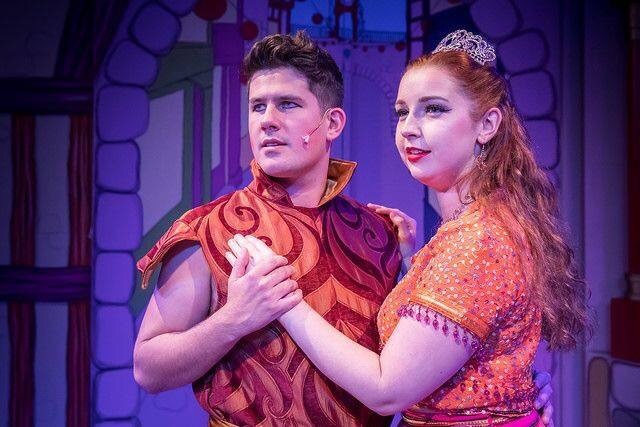 With panto season in full swing up and down the country, We Are Chester’s deputy editor Antonia Jones dropped into the city’s Forum Studio Theatre at the weekend for a foot stomping, hands waving, body shaking performance of Aladdin by Tip Top Productions. Photos: Mark Carline and Antonia Merola Jones. It doesn’t feel like Christmas to me unless I’ve been to at least one pantomime and laughed out loud at the silly comic, corny jokes and local references, before dancing in the aisles to some old and new favourites – and on Saturday afternoon I did just that! This was my first panto of the 2018 festive season and what a corker to start with – Aladdin, staged by Tip Top Productions and written once again by Peter Swingler OBE. The show, the 10th pantomime to be staged by the company at the cosy Chester venue, is suitable for all ages – from babies and toddlers, right through to grannies and grandads. And if you’ve seen a Tip Top panto before, you’ll be delighted to see some familiar faces in this year’s cast. We took our seats right at the back but you can sit pretty much anywhere in this intimate venue and get a good view of the stage. The show is set in Old Peking, China, where Aladdin (Ashely Sollars) battles the evil Abanazar (Ethan Holmes) in his bid to gain the magic lamp and rescue princess Jasmine (Jade Pritchard) with the help of the magical Genie and the Slave of the Ring, played by the extremely funny Andrew Rawlinson-Heath. Aladdin opened the show with Chesney Hawkes’s hit I am the One and Only and vocals were on point as he danced with a group of Chinese-style dancers whose costumes and choreography throughout the show was impressive. Aladdin was then joined by his love interest, princess Jasmine performing one of my current favourite songs from The Greatest Showman, A Million Years. Both had great vocals and harmonies throughout the song. I really enjoyed singing along too! It wasn’t long before the audience met Wishee Washee played by the very lovable Dan Ellis and the hilariously funny Widow Twanky (Kevin Dewsbury). Wishee Washee arrived on stage on a scooter, joking that it was better than Northern Rail, which made the audience chuckle. His interaction with the audience both young and old was fabulous and kept us on our toes (literally with the dancing) and laughing throughout. Widow Twanky, who introduced herself as a ‘Vicars-Cross Dresser’ had me in stitches all the way through with her outrageous outfits, adult-related humour, local references and her interaction with her Siri application on her iPhone watch, which provided many laughs – especially when she asked Siri where was a good place to be alone and Siri replied Chester’s Deva Stadium! Channelling his inner villain as the panto’s very own baddie, the evil Abanazar (Holmes) whose dynamic with Widow Twanky was fabulous, got lots of hisses and boos which meant his job was done! Holmes showed professionalism throughout when there were some technical difficulties and even made jokes when some lines got mixed up – but this all added to the experience and I thoroughly enjoyed his scenes. However, the Slave of the Ring stole the show for me. He danced on stage in all his glory and was definitely my favourite character! His pint-sized stature oozed confidence and his ‘brummy’ accent, mixed with cockney-rhyming slang, had me crying with laughter! He also played his ‘twin’, the Genie in the lamp, who was projected on the wall of the stage and helped to save the day – to rescue princes Jasmine from the arms of evil Abanazar so she could marry her true love Aladdin. Hooray! With well-known pop songs from Arianna Grande’s One Last Time, Elton John’s I’m still Standing, and Diana Ross’s Chain Reaction, there was certainly something for everyone. There was plenty of audience participation too when we all felt like we had gone back to the 1970s with The Time Warp song, where we were encouraged to stand up and do all the actions – this was great fun! It was a nice touch at the end as well when Ellis, who plays Wishee Washee selected some children in the audience to take part in a sing-along – it made the panto run over a bit but it was lovely to see and Wishee Washee was certainly a firm favourite with both young and old! We left the panto feeling uplifted and very festive – it’s a must see for anyone who enjoys plenty of songs, dance and laughter but get your tickets as most performances are sold out. Full details of Aladdin, which runs until January 5, including performance dates and times and ticket prices including family and group tickets can be found at www.chestertheatre.co.uk where tickets can be booked online. Alternatively, contact the box office on 01244 341296.